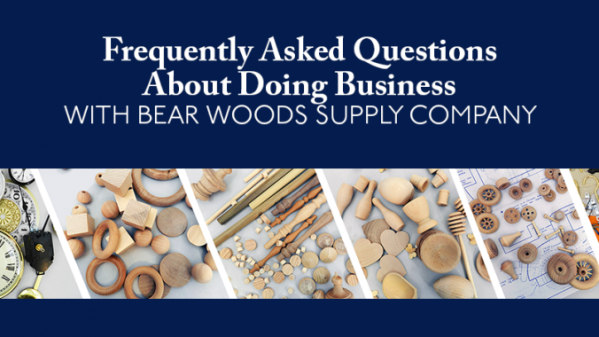 If you are looking to purchase woodworking supplies and clock parts, you may be looking to place an order with Bear Woods Supply Company. Before you place an order with any company on the internet, you should do your research to ensure they are a reputable company and that you understand their buying process. Here are a few of the FAQs you may have. Do You Have to Make an Account Before Making a Purchase? When you are looking to make a purchase with us, you will be asked whether you wish to create or register an account. This may leave you wondering if you have to. You never have to register an account if you do not want to — you can always check out as a guest. However, there are many benefits associated with registering an account with Bear Woods Supply Company. What are the Benefits of Registering With Bear Woods? When you register an account with Bear Woods Supply Company, you can create a wish list. A wish list allows you to create a list of items that you may wish to purchase in the future, but don’t want to purchase now. Another benefit of registering is that you can re-order quickly. We keep track of the items you purchase and allow you to re-order them quickly and easily. Lastly, checkout is faster if you have an account. You do not have to enter your shipping or billing address, as we store that information for you. How Does Pricing and Quantities Work? When you are looking to add items to your cart, you will see pricing tables. For most products, pricing is lower as you increase the quantities. In the pricing table, take a look below the pricing to see the quantity we base the price on. In this example, the prices are based on buying bags of 25 wooden balls. So buying 1 bag at a time is $8.02, but if you buy 4 bags at a time your price is $7. 40 per bag. If you have any questions about pricing and quantities, be sure to call or email us. In most cases, we will ship your items by the next business day. If they happen to be out of stock, we will contact you and let you know when we expect to have them available again. Items that are marked as a special order will ship within two to four weeks. How do I know what shipping will cost? Shipping is calculated at the Shopping Cart page. On the top of every page you will see the shopping cart link. Once you are at your shopping cart, you will be asked to enter your postal code/zip code and then the website will give you several shipping options, using the postal service or UPS. NOTE – we pass on shipping at our cost, and shipping is by weight. After placing the items you wish to purchase in your cart, be sure to enter coupon code SAVE5 for five percent off any order of $25 or more.